In a bid to make justice accessible for all, IDLO has launched a series of Consultations on customary and informal justice systems. The global dialogue is informed by a series of publications titled “Navigating Complex Pathways to Justice: Engagement with Customary and Informal Justice Systems” that seeks to advance policy dialogue and distil lessons from programming and research, to help realize Sustainable Development Goal 16. 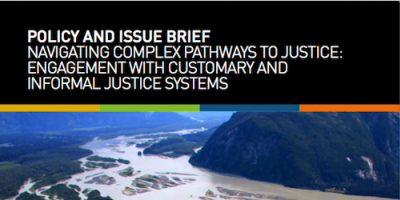 This Policy and Issue Brief presents findings and policy recommendations for engaging with customary and informal justice systems, and providing information on features and challenges related to engagement.